This Spring House was used by the family living at the colonial Ferry House across route 9. The Spring House and the Store Barn facing the Ferry House are the only outbuildings of a once thriving family homestead and tavern. 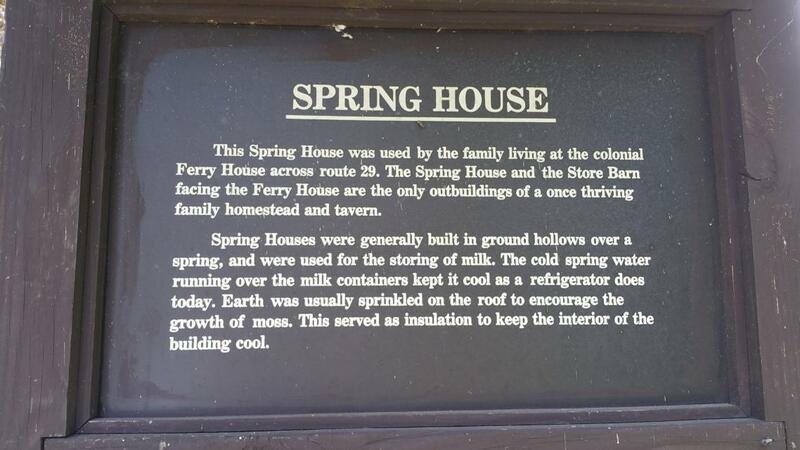 Spring Houses were generally built in ground hollows over a spring, and were used for the storing of milk. The cold spring water running over the milk containers kept it cool as a refrigerator does today. Earth was usually sprinkled on the roof to encourage the growth of moss. This served as insulation to keep the interior of the building cool. Do not attempt to view this from rt 29. Park in lower Washington Crossing SP parking lot and walk around. Very dangerous spot from 29. This marker can also be identified by its HM code. You can use the hashtag #HM1606 in tweets, and any other place where you might refer to this marker, including when searching on this site.